Buying into a franchise is an exciting prospect. You are investing in a brand that is already known, established, and hopefully credible, and helping continue its growth and development. Managing a national brand is an incredible challenge as well. Growing a business that operates all throughout the country offers a unique set of challenges. Whether you are buying in or managing, there are certain things you must know when it comes to marketing and public relations (PR) if you are a new franchise. Here are some tips. I came in at a fabulous time, just as Super Bowl activities downtown were ramping up and our office was serving as a warming hut, remote worksite and after-5 party central for Weber colleagues and clients from around the country. I’ve been so impressed with the skill, vigor and professionalism here. This firm has always been deeply engaged in the community, as in our central role with the Super Bowl Host Committee. I also got the opportunity to spend a few days in New York with colleagues from 31 offices across the Americas. They came from North America, Brazil and Colombia. It was a bit of drinking from the fire hose but I got a great sense of the creative talent, integrated media thinking and analytics reshaping our work. I knew it already, but the experience affirmed my decision to come here. I was trained as a traditional P&G marketer but to sustain myself I had to figure out the change that came with the influx of digital and new media. The industry continues to evolve by leaps and bounds. Agencies that resist adapting to these changes quickly fade away. The way information is shared is so democratized now. Consumers don’t just receive information, they share experiences and influence one another. So the best way to convert them to a brand or an idea is through stories from others that are believable and authentic—not just cerebral but emotional. It’s why social media is so important.At the end of the day, we have to solve clients’ problems. We’re basically a talent business that needs to be sure our solutions are on point, relevant to clients and help them move their business forward. To do that we have to make sure we have the right mix of people in our agency – we have to not only know where to put the apostrophe but also provide the creative paths that influence decisions and behavior. The Minnesota chapter of the Public Relations Society of America (PRSA) has installed its executive leadership team and Board of Directors for 2018. The board’s first full meeting will be held Feb. 20, in Minneapolis. Led by President Eva Keiser, APR, principal at the plural i, Minnesota PRSA is comprised of nearly 400 corporate, agency, independent, non-profit and government public relations professionals from Minnesota, the Dakotas and western Wisconsin. 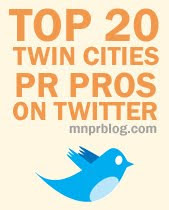 Through its programs and services, Minnesota PRSA delivers on its mission to engage its members at every stage of their careers with the knowledge, resources and connections to achieve professional excellence. Sean McDonnell, APR, McDonnell & Co.